I'm still thinking about 'Coming Home', Fiona Tan's show of two video works spread between Paddington's admirable Sherman Contemporary Art Foundation and the charming gallery of the National Art School (where you can also take in a spot of Norman McLaren if you fancy). 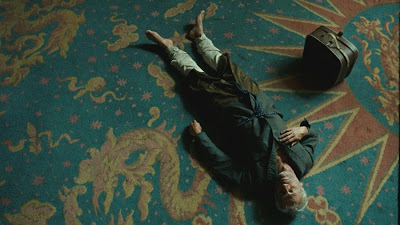 I imagine I'll feel like this for some time these twin meditations on Orientalism, history and our subconscious take such a profound and subtle look at a cultural and psychological condition that they already feel like that rare thing, a parallel critique of feelings and thoughts. 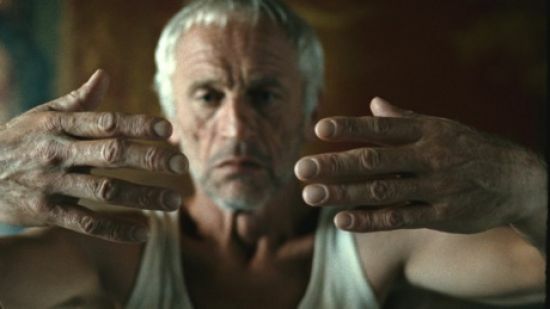 The two works, 'A Lapse of Memory' and 'Disorient' are big, almost cinematic, affairs with high production values, most notably a poetic sense of editing and a sound design that is integral to meaning. 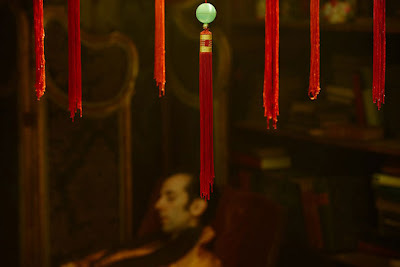 They are connected thematically, both deal with memory and place and are to greater or lesser extent concerned with orientalism and the psyche of the traveller. 'Disorient', the work at Sherman, is composed of projections onto two large screens facing one an other running out of synch in a continuous loop. At one end of the room is what looks like a travelogue through Asia with handheld video and newsreel footage. Over this is a calm measured English voice reads from Marco Polo's journals, a flat factual narrative where he describes the social characteristics, trade, religion and character of each of the people's he encounters. For the most part this avoids the picturesque clichés of the Orient. So whilst geishas and temples are eschewed the camera might shakily pan around an empty factory or through street traffic giving an equal weight to each. The more familiar images that break through are Chinese troops charging Tibetan demonstrators or the inevitable and timeless armed convoys in Afghanistan. This is done in a less heavy handed way than it might sound from that description even though the images always provide a light counterpoint to the Venetian explorer's text. It serves to remind us of the mutability of our pre-conceptions about distant cultures, the inevitably selective imagery we encounter can replace one myth with another as easily as it can reinforce the ancient. As Polo, and the viewer, moves from place to place we see the anonymous cloud banks outside every airliner's window. Marco Polo was a merchant before he ever became a chronicler of the East and we ought to remember this as we see him characterise each country by its industry and trading habits, the news footage shows that now we are as likely to be conditioned by a foreign correspondent and their cameras, thus the world changes with the lens through which it is seen. Tan creates or presents some gorgeous individual images, a blue dyed dog skulking thorugh an indigo factory, a young man with a bicycle kneeling on a broken concrete slab as he prays in the Iraqui twilight and the sight of a whole car body carried atop a camel on a mountain pass might be forever memorable. The travelogue screen might be the visible, the external version of our engagement with Asia, but facing it is a slow luscious film that can only represent the recesses of our minds. In deep reds and blacks this projection is a slow close up tour of the shelves and corridors of what at first seems an oriental junk shop. 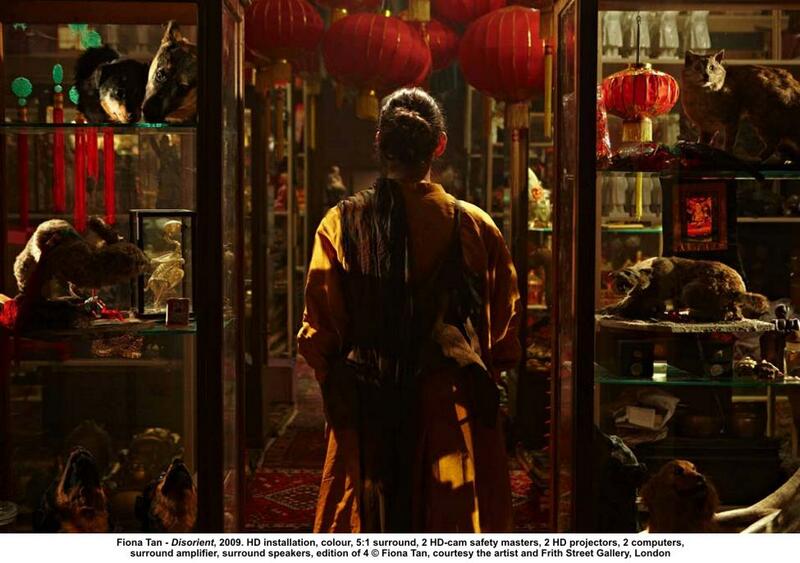 Everything is here, Buddhas, birdcages, masks, dragons, elephants, clouds of silk and spice. The confusion of culture and category in this cabinet of wonders feels intentional, it presents an Orient of otherness, of familiar versions of the exotic. Each of the objects and artefacts here represent something bigger, a broader looser vision of the inscrutable strangeness of the East. 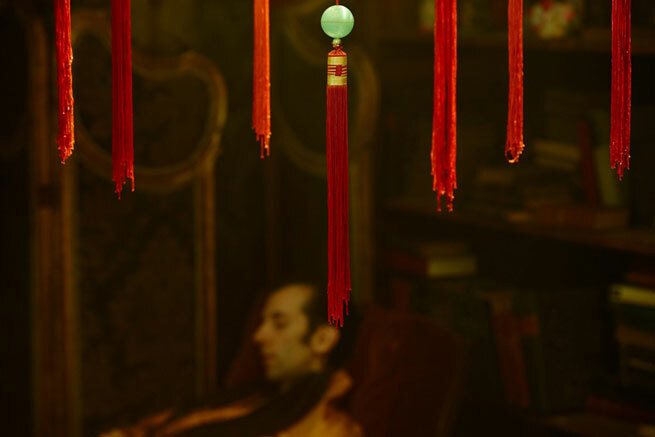 This is made all the stranger by an unexplained man who appears in what might be the saffron robes of a monk, he seems like a keeper, of a shop or of memories but you suspect that we have only seen a little of his domain and that the shelves are a tiny part of some Borgesian labyrinth. Tan is accomplished in her medium and much more than a creator of tableaux, the pacing of the smooth camera moves and the subtlety of the edit creates an ethereal feel. There is the layered shimmer of lacquer here, the light of consciousness is being reflected and captured constantly so that you can almost see our own assumptions and beliefs about the Orient in each object. When one looks between the two screens it is clear how much more vivid and detailed the inner imaginary world of symbols and signs is than the messy, shaky reality of the travelogue. On its own this would be a glib observation (but plenty of works have been created on single insights far less profound than this) but the density of the veneered layers of image and idea make 'Disorient' a beautifully puzzling work. 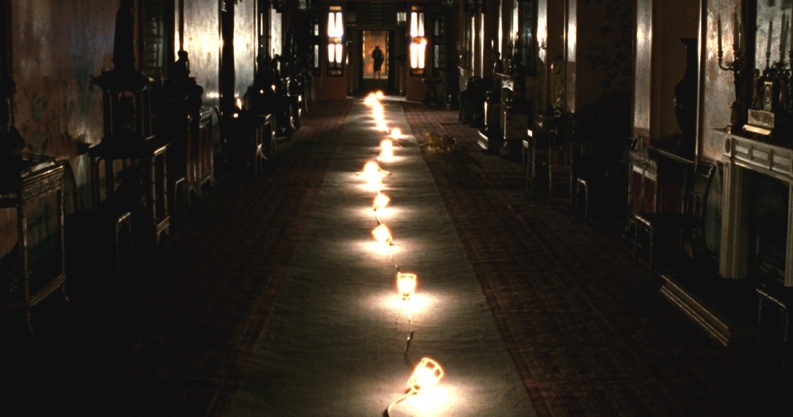 No less beautiful, but perhaps less complex, is the second work, 'A Lapse of Memory'. This is an almost narrative piece that follows a curious old man around a rococo oriental place (which turns out to be the Royal Pavillion in Brighton, England). We learn the man's name is Henry and that he once travelled and may or may not be Asian. 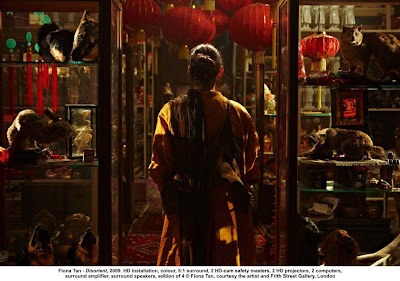 The film mostly observes the ritual;s of his day as he scuttles through the extravagantly colourful, but peeling and shabby, Chinoiserie of the building. He too might be a keeper, but this time of something lost, of an absence. We are told that "Henry is waiting for a story he can make his home" and what we hear about are fragments of arrivals, departures and voyages. Henry's memory palace is made to feel afloat and adrift by the sound of ocean borne gulls on the soundtrack and that sense of dislocation is pervasive. Again Tan combines a beautiful technique, notably here the sound design, with individual images of pervasive beauty. 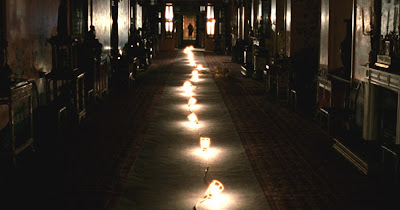 A sequence where Henry lays and gathers lengths of inspection lamps in a long corridor is breathtaking and the frames where he lays himself to sleep beneath an umbrella feels unexplainably poignant. My sole reservation is with the voice over. The knowing self referentiality of reading the shooting script is irritating and the only occasionally poetic non-sequitirs of the script tend toward the pretentious. It's a difficult line to follow, the images Tan creates are pregnant with possibility, light of touch and confident. Prose is oddly far more concrete, it exists to describe the specific and negates some of that wonder Henry's story, or stories, or the story which he seeks, is held in his rituals and his traverses of the rooms not in the narration but it also comes from what we might imagine that story could be, after all it not only Henry who is searching for a narrative. These works are far more interesting than their PR descriptions. All too often the press releases and verbiage that surround shows don't do them justice, they obfuscate or attempt to connect with art touchstones rather than describe an experience. I think that this is the case with Tan's work here. It doesn't matter that one work was made for Venice and that subsequently it can be seen as an essay on that serene republic's pivotal role in east/west trade, nor does the identity of Henry's home, the Regency chinoise Brighton Pavillion. It's not uninteresting but it presents the viewer with a terribly limited lens and to come at works such as these with a pre-conceived idea of meaning is a great shame, they hold so much more than these locational puns. Tan's work is a gorgeous, serious and thoughtful meditation on memory and identity. It is powerful because as it deals with those subjects it doesn't reduce them to badges and positions or a précis of Edward Said, but instead captures the fragility of consciousness and the shifting sands of identity through time. These two pieces are small wonders and we are lucky that they are on show until June.